“Output gap” is one of the indicators used to gauge to what extent a country is able to mobilize its productive potential. (Capacity utilization rate is another similar indicator.) 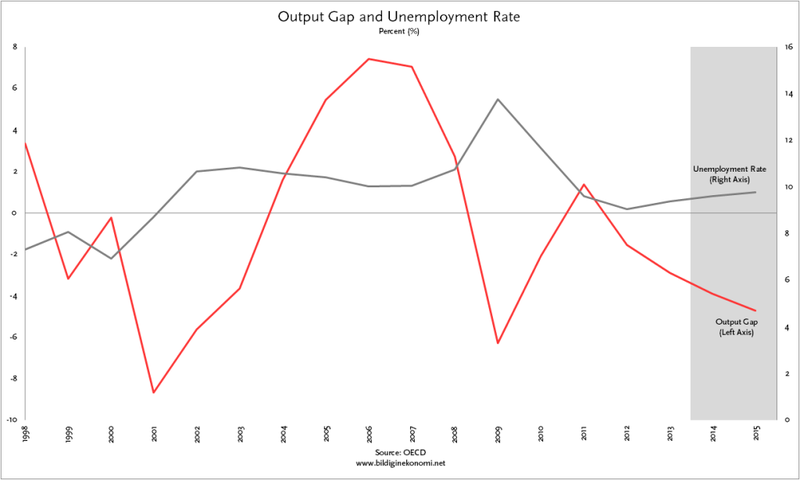 If output gap is negative, the country’s actual production levels are below its potential. If outgap gap is positive, the actual production is above its potential. OECD has defined “Potential GDP” as the level of production that a country can realize under conditions of non-constant inflation rate. If an economy produces above it potential output level, this leads to a rise in the inflation rate. Potential out is determined by a country’s capital stock, potential labor force (itself based on demographic factors and labor force participation rates), labor productivity and the non-accelerating inflation rate of unemployment (NAIRU). Table 1 compares potential and actual (nominal) output levels of Turkey between 1998 and 2015. (Last two years are OECD projections.) During the periods of crisis (2000-2003 and 2009-2010) country’s aggregate output remained below its potential. Since 2011, the actual output has remained below the potential. In Table 2, this phenomenon is represented directly as “output gap”. In years when output gap is negative, we observe a rise in the unemployment rate. After it reached a positive level in 2011, outgap returned to negative levels in the subsequent years. This is reflected in the gradual rise in the rate of unemployment. 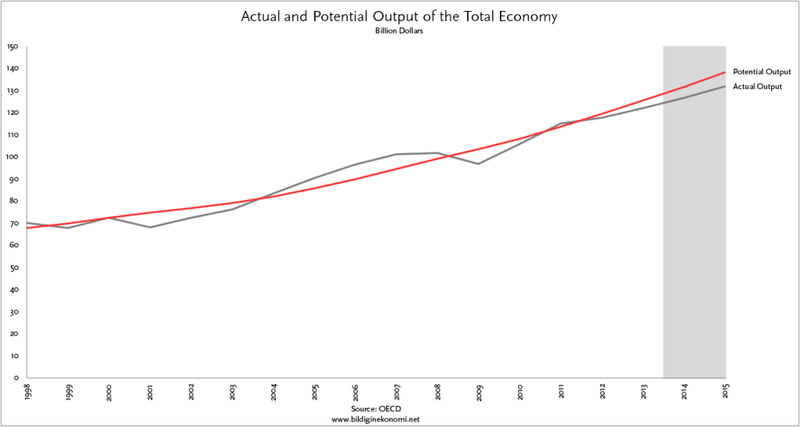 Dataset is downloaded from the OECD website, “Economic Outlook No 93 – June 2013 – OECD Annual Projections” link.